The Sheriff’s Office continues to investigate this incident. 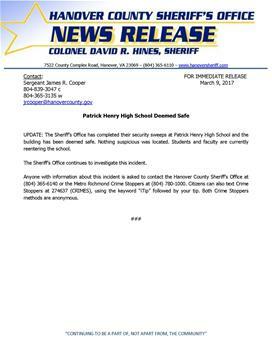 Hanover, VA – The Sheriff’s Office is currently investigating a bomb threat at Patrick Henry High School. All students and faculty have been safely evacuated and no injuries have been reported. Bomb detecting K-9s are on scene at this time along with Sheriff’s Office personnel, who are conducting security sweeps of each building. Further updates will be provided as they become available.